Professional dive training on an internship to complete the PADI Divemaster will benefit much more than just completing the formal performance requirements! Our Go PRO internship programs to include professional dive training on any of the professional courses we conduct at our premier PADI 5 Star IDC Dive Centre is really beneficial to our candidates, as they get to fully experience the real dive lifestyle and be prepared for the dive industry! 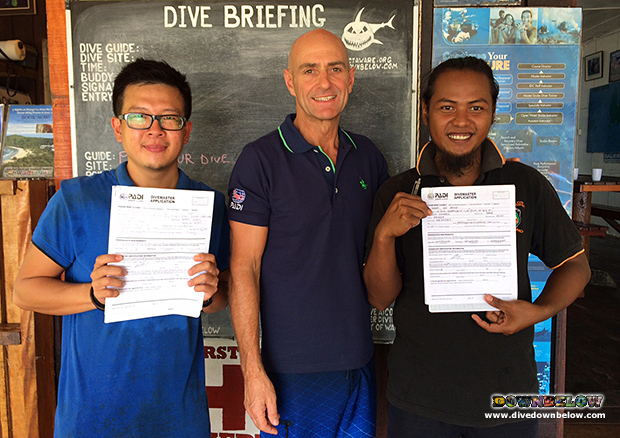 Azhar and Adam have completed the formal performance requirements for their PADI Divemaster course, yes, however they received so much more on their 1-year professional internship, which is catered to suit our local candidates. This “Work for a Career” program is fully sponsored by Downbelow. Experiencing the dive lifestyle includes a variety of activities, such as participating on marine conservation projects, assisting our team of PADI professionals on the conduct of their various PADI courses and programs, observing the running of a smooth dive operations. Resident Platinum PADI Course Diretor Richard Swann leads our Go PRO team of PADI Instructor Trainers, who are responsible for the development of all professional dive training. The team are more than satisfied with the boys’ progress, and anticipate their professional development to continue further! For more information on developing your dive skills and Go PRO in Kota Kinabalu, Sabah, contact one of our Go PRO advisors to create a suitable itinerary catered to your individual goals.